If your system suddenly decided to shut itself down, or there was some kind of audible alarm coming from the machine you have never heard of before, would you know what the problem was? A common cause for this is that your computer’s Central Processing Unit (CPU) has reached its critical operating temperature and has shut itself down to prevent damaging it, or an alarm is telling you it’s about to shut down. There are a lot of reasons why your computer’s CPU has gotten too hot; the cooling fan has stopped working or its airflow is being blocked by dust or dirt, the layer of thermal paste between the heatsink and CPU has gone bad and needs replacing, or maybe the processor is being run at a higher operating frequency / voltage than normal. Something else which can cause this is blocking the cooling vents in laptops and netbooks by placing them on a bed or sofa, which is obviously easy to prevent. To help understand why this might be happening, a lot of users want to know what the maximum temperature is that a processor can work at before these critical situations occur, and any measures that can be taken to stop it from happening. All processors heat up to some degree, some higher than others. Obviously there are many conditions that affect why one CPU would heat up more than another such as ambient temperature, airflow in the case and the type of cooler etc. A lot of CPU coolers over the years have been very inefficient at doing the job of cooling the chip down effectively. To start off, the temperature of most processors can be read via a set of sensors either on the motherboard or inside the processor itself. Your motherboard may have come with a program for reading the sensor temperatures, but if not, there are several free tools around the internet to help. Some of the tools we recommend for the job are SpeedFan, Open Hardware Monitor or HWMonitor. 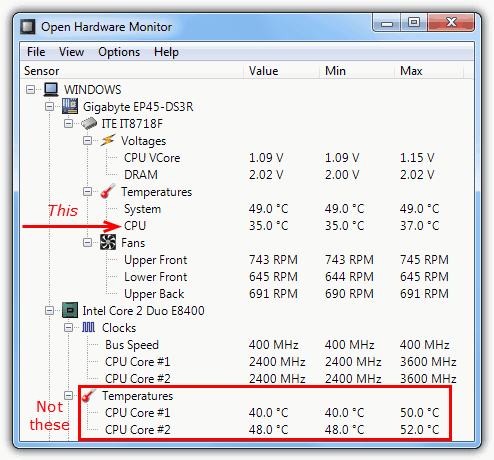 Something you need to be aware of is some monitoring software might give you 2 sets of temperatures, a single CPU value and possibly a multiple CORE value which will show each core temperature value for a dual or quad core processor. The single value is what you need to make note of as this is the value you will see in the BIOS, and is also the temperature reading that will trigger any system shutdown or audio alarm. Another way of checking the CPU temperature is through the BIOS, under a menu that has different names but is usually along the lines of “System Health”, “Sensors” or “PC Health Status” etc. This will also probably give you motherboard temperature, voltages and CPU fan speed. 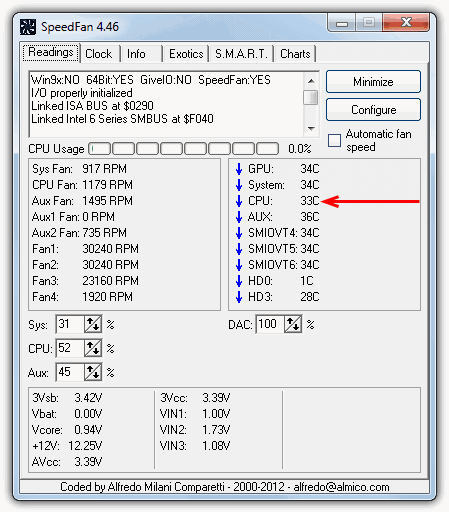 You should be able to setup an audible alarm for the CPU temperature (show below as Warning Temperature) and also for the CPU fan which will sound an alarm if the system detects the fan has stopped spinning. Different BIOS’s have other warnings and alarms, another common one is “Shutdown Temperature” will you can set to a value and the system will shutdown if the CPU reaches it. Although occasionally a BIOS can be slightly inaccurate with temperature readings, which a BIOS update can sometimes cure, you might notice the CPU temperature looks higher here than what it does when idle in Windows. This is because weirdly even though a BIOS doesn’t really require many CPU cycles to function, CPU usage can actually be anywhere between 50% – 100% while in there! So, you know what your CPU temperatures are, but how do you know what the limit for your processor actually is before it will shut itself down? I found a great site that has a table of most of the major processors of recent years along with their basic information taken from the official manufacturer specs. Included are voltage, wattage, and importantly maximum temperatures for each chip. The value of “Max case temp” or “Max cover temp” is what you need to look at, and doesn’t mean the temperature inside your PC case. But rather the maximum allowable temperature inside the metal casing of the processor itself. When the temperature reading from the BIOS or Windows utility reaches the number shown for your chip, it will cause a shutdown. 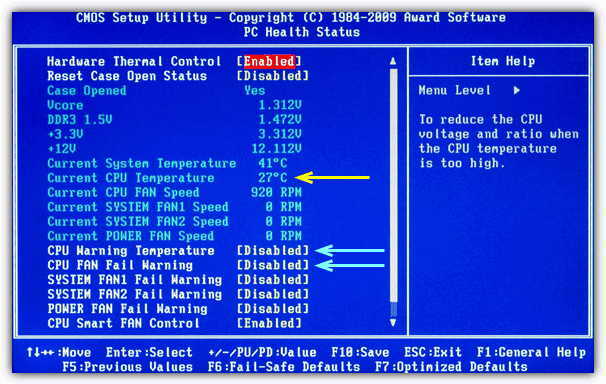 As a simple example, to find out the maximum allowable temperature for my old Intel C2 Q6600 processor I simply look for it in the chart and check the max cover / case temp column. The value is 71°C and now I know that if it ever reaches this temperature, the system is in danger of shutting itself down. Using this information you can then set any warning or shutdown options in the BIOS to a bit below the level shown for your processor. If you want to know how high your CPU temperature can reach within your current configuration, running a system stress tester such as Prime95 or Heavyload to put 100% load on the CPU for a few hours will give you a good idea. Just remember to monitor your temperatures during this time to make sure it doesn’t reach the critical shutdown temperature. Firstly, I would recommend you reset your BIOS to defaults as it may be overclocking without you knowing about it. Some BIOS’s have something like a High Performance option which could automatically try to up the clocks which will obviously increase temps greatly. Another thing is, have you fitted the cooler correctly? Usually all 4 corners will click when they are in place and if you just try to gently pull each corner upwards and it moves, it means the cooler is not quite seated correctly. Don’t take the cooler off unless you have some thermal paste to replace it with as reusing paste is a no no. Also, what are you using to get the temps and how high is the ambient temperature?